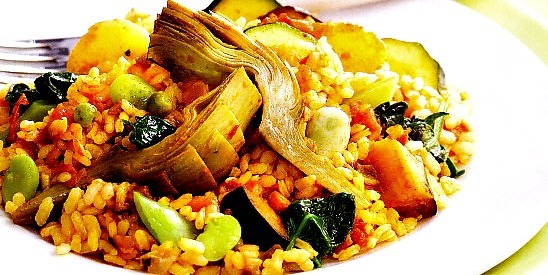 The rice to fill these stuffed peppers, which are typical of the mountain towns of Alcoy and Bocairent, cooks in the sweet juices from the tomato and pepper. Cut off the stem ends of the peppers, keeping them as lids to replace later, and scrape out the inner membranes with a teaspoon. Heat the oil, sauté the red pepper slowly until it is tender and remove. Fry the onion until tender, add the meat and brown it lightly, adding the tomato after a few minutes, then put back the cooked pepper, and stir in the raw rice, saffron and parsley. Salt to taste. Fill the peppers carefully and lay them on their side in an ovenproof dish, being careful the filling doesn't fall out (you can wrap them in tinfoil to help hold them together). Cover the dish and put it in a hot oven for about 1 1/2 hours. The rice cooks in the juices from the tomato and pepper. If the peppers are thin-skinned, you may need to add a little stock towards the end of the cooking time.